The attacks had begun with the extreme right wing spitting out Obama's full name--Barack HUSSEIN Obama, as if somehow he wasn't an American but connected to the Iraqi dictator who, despite the Bush Administration's best efforts, had no connections to 9/11. When the right-wingers and Tea Party Pack get tired of their "cutesy" attempts to link Obama to militant Muslims, they launch half-truths and lies to claim he wasn't born in the United States. 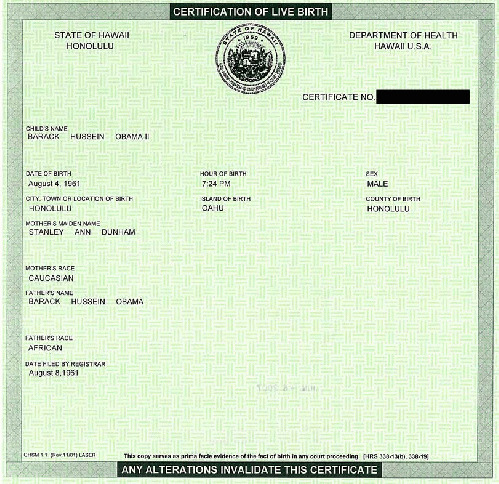 Like Jaws, Jason, or Freddy Krueger, "birther" propaganda keeps returning, even when independent state officials and analysts proved the claims false. The issue simmered on Fox TV and talk radio until Donald Trump, the man with the planet-sized ego and the bacteria-sized brain, inserted his persona into the issue, while pontificating about becoming the next president. The media, exhausted from having to cover the antics of Lindsay Lohan and Charlie Sheen, turned their news columns over to the man who would be God--if only it paid better. The Wing Nut Cotillion, with Trump getting the headlines, then demanded Obama produce a long-form birth certificate--which he did while leading a combined White House-CIA-Pentagon effort to find and destroy Osama bin Laden. The truth still hasn't quieted the conspiracy nuts.